Edinburgh head coach Alan Solomons has called on the home crowd to help his players make history in Friday's European Challenge Cup semi-final against Newport Gwent Dragons. If Edinburgh win at Murrayfield, they will be the first Scottish team to contest a European rugby final. Dragons are bidding to reach their first final since 2003. 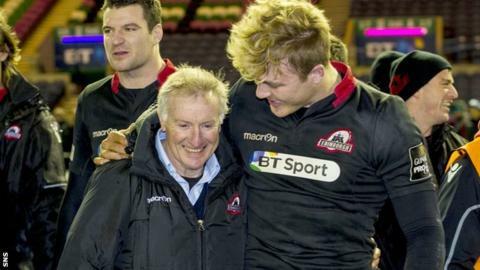 "To make it a real advantage for us we need a big crowd," Solomons told BBC Scotland. "We need the type of crowd we had in the 1872 game [against Glasgow] here. We had 15,000 people and I'm really hoping we'll get that sort of crowd." Whoever wins will next meet either Gloucester or Exeter, who contest the other semi-final on Saturday. "We've gone through some massive challenges this season," said Solomons. "Every challenge we've risen to. "For our coaching staff, our medical staff, our conditioning staff and our players it'll mean a massive amount and dare I say it it'll mean a massive amount for Scottish rugby." Edinburgh wing Dougie Fife is hoping the success of his side - and Glasgow Warriors - can help spark a revival in fortunes for Scotland before this year's World Cup. He added: "Glasgow are going well in the league and we've done well in the cup. "It's really exciting times. It's going to be a massive game, there should be a good crowd, and hopefully we do a good job. "It's a great opportunity for us as well, playing a team we know really well. It's one both teams will go into with confidence." The Dragons beat Pro12 champions Leinster 25-22 on Sunday after being 22-8 down with 30 minutes remaining. The win was the Welsh region's fourth consecutive victory in all competitions, and the first time they have done the double over the Irish province. "They're a physical team," added Fife. "We know they'll bring their physicality, but so will we. "Up front it'll be physical, and at the back when we get a chance we need to take it."